The OmniConverter FPoE/SL, FPoE/S and FPoE+/S are multi-port media converters that convert 10/100BASE-T copper to 100BASE-X fiber and support Power-over-Ethernet (PoE and PoE+). Classified as Power Sourcing Equipment (PSE), they provide power to one or two Powered Devices (PDs) using standard UTP cables that carry the Ethernet data. The OmniConverter FPoE/SL, FPoE/S and FPoE+/S are industrial multi-port media converters that convert 10/100BASE-T copper to 100BASE-X fiber and support Powerover- Ethernet (PoE and PoE+). Classified as Power Sourcing Equipment (PSE), they function as PoE injectors that provide power to one or two Powered Devices (PDs) using standard UTP cables that carry the Ethernet data. The OmniConverter FPoE/SL is a cost-effective media converter that provides up to 15.40W PoE (IEEE 802.3af) per RJ-45 port and supports frame sizes up to 2,000 bytes. The OmniConverter FPoE/S provides up to 15.40W PoE (IEEE 802.3af) per RJ-45 port and supports frame sizes up to 10,240 bytes. The OmniConverter FPoE+/S provides up to 34.20W PoE+ (IEEE 802.3at) per RJ-45 port and supports frame sizes up to 10,240 bytes. The FPoE+/S powers the more demanding PDs such as outdoor PTZ (pan-tilt-zoom) cameras and multi-band, multi-stream wireless access points. Models with two fiber ports support redundant fiber optic uplinks for critical applications that require protection and sub 50ms restoration in the event of a fiber failure. The second fiber port may also be used to cascade multiple media converters, or it may be used as another switch port. Configurable features include link modes and a PoE power reset function that enables a PD device to be re-initialized remotely. When a problem with a PD is identified, the fiber port on a managed switch can be shut down or disconnected, enabling the PoE power reset function on the OmniConverter. The PoE power to the PD is disabled for 2 seconds when a loss of receive fiber link is detected by the OmniConverter, eliminating the need for costly truck rolls to remote PD sites. Link modes can be configured to propagate loss-of-link faults to managed devices, immediately notifying administrators of network outages. OmniConverter media converters support fixed-fiber connectors and Small Form Pluggable (SFP) transceivers, enabling easy adaptability to different fiber types, distances and wavelengths. They support multimode and single-mode dual fiber; and single-mode single-fiber, in standard and CWDM wavelengths. The compact standalone OmniConverter media converters can be tabletop mounted, wall mounted, or DIN-rail mounted using an optional DIN-rail mounting kit. They can also be mounted on a 1U 19” rack-mount shelf. They are available with DC power input via terminal connectors or external 100 to 240V AC power adapters. In this application diagram, OmniConverter PoE injector media converters are deployed to overcome the distance limitation of UTP copper cabling by enabling fiber connectivity to PoE powered Wi-Fi access points and IP surveillance cameras. The fiber originates from a data closet or network hub location. Fiber is distributed from a copper Ethernet switch with iConverter 10/100 media converters installed in a highdensity 19-module chassis. On the top half of the diagram, Wi-Fi access points are installed on buildings in a business complex. A 100Mbps point-to-point fiber run is terminated with an OmniConverter PoE media converter installed near a convenient AC or DC power source. The OmniConverter converts the fiber to copper and injects Power over Ethernet (PoE or PoE+) with dual RJ-45 ports to power two Wi-Fi access points. Redundant fiber links are run to another location where an OmniConverter with dual fiber ports provides protected fiber link redundancy, media conversion and PoE power for two Wi-Fi access points. The OmniConverter provides fiber failover protection in less than 50ms if there is a loss of fiber link. On the bottom half of the diagram, OmniConverter PoE media converters are deployed in NEMA enclosures installed on light poles to provide fiber connectivity and PoE power to IP surveillance cameras. 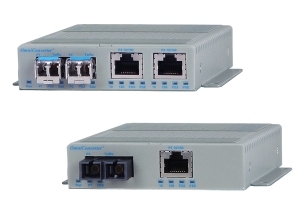 The dual fiber ports on the OmniConverters enable a fiber daisy chain architecture that connects multiple IP surveillance cameras. One port is the fiber uplink, and the other port is the fiber downlink to the next OmniConverter. Daisy chains are useful when deploying multiple PoE or PoE+ devices in a linear fashion along city streets, highways, rail lines, border fences, or pipelines. 2A minimum of 52VDC is required to guarantee 25.5 watts at 100 meters on Cat 5 cable or better. Contact Omnitron for other fiber options, operational temperature ranges and RoHS (5/6) compliant models. Order the appropriate SFPs separately. Visit the Omnitron Optical Transceivers web page.